I remember growing up with those five-games-in-two-days tournaments where soccer parents filled the sideline with lawn chairs while cheering on their nine-year-old future Mia Hamms. There was always that poor volunteer parent who was cajoled into supplying the orange slices, juice boxes, and PB&Js. Another Mean Girls “cool mom” would be sure to bring the colored hair spray and prewrap so everyone looked great in the 30th minute as blue sweat-mixed dye dripped down their shining faces. Finally, the soccer-dad-turned-coach with his unheeded advice to rest in-between games would always be ready to inspire young minds with his tactical prowess during halftime speeches. Needless to say, soccer was always a family affair. My teammates became my sisters, but my real family was always nearby. Flash forward a few thousands games and very little has changed. My teammates have again become my family away from home and our coach is a tactical wizard. However, my family, my rock, my support system through the highs and lows, is too spread out to catch every game live. Now, because we all know that soccer trumps jobs, social lives, and financial obligations, I don’t understand why they don’t drop everything and follow me around. For anyone wondering, that was dripping with sarcasm (my biggest flaw). I really do love my family and appreciate their unwavering support even when they can’t be five feet from the action. They’ve tuned into countless games via spotty live streams, followed along on Twitter, and stayed up into the wee hours of the night to catch my games for years. To end the pity party, I’ll simply say life away from family is tough, but I wouldn’t change my job or the opportunity I have to play this game because I know they support me through it all. My most recent change happened to be one of the greatest moves of my career. When the Boston Breakers folded this past offseason (RIP), Laura Harvey took a chance on me through the dispersal draft. I found myself with the chance of a lifetime: making history with the beginning of the newest NWSL franchise, the Utah Royals. With the help of our incredible owner Dell Loy Hansen and the entire Salt Lake City community, our club was born. We recently unveiled our royal playground with the support of more than 19,000 fans. I can’t even begin to explain how incredible it was to see so many passionate people ready for women’s soccer in Salt Lake City. While I want to thank every single one of you who attended the home opener, there were a few special people in attendance because our owner knew the sacrifices that we’ve made along the way. Hats off to a selfless, zealous visionary leading the way to break glass ceilings and improve our league so that it’s recognized as the greatest in the world. Mr. Hansen not only brought together this new royal family (sorry, Prince Harry), he also flew our families to the home opener so they could be a part of history sans the dirty lawn chairs from the childhood days. So as we made it through a bumpy national anthem and huddled in for one last U-TAH chant, we looked up at section 19. I, for one, lost my breath as we saw our loving parents, siblings, partners, and kids cheering us on LIVE. IN PERSON. RIGHHHT THERE BEHIND US. I may have been slightly more emotional than normal (no, I didn’t not cry.) And despite the result, which we will soon rectify, the comforting presence of our families, the incredible support from our organization, and the demonstration of women’s soccer’s growth in America all made for the most memorable soccer weekend. The hardest thing about our jobs may be the uncertainty. There is so little predictability in regards to where we will be playing or how we will perform. Maybe that’s what makes it so exciting. Or perhaps that’s why it can be so stressful. Fortunately, at the end of the day, we can rely on our families to be there. They often let us vent our frustrations or cheer us up on our bad days. They offer advice on how to deal with real-life things like taxes. (Speaking of which, who’s relieved that April 15 has passed and all seven state nonresident income papers are filed?) Our families stick with us through every move and every new team (new number, who this?). Thus, we cherish the rare chances we get to hang out with them in our newest soccer world. I was so happy to have my family with me during our home opener to witness an entire city developing a new soccer world. They were our very first fans at age four, and now they’re among our 19k strong Royal entourage. What a day for that little girl inside all of us who still envisions running through the parent tunnel on the sideline after you won the 32nd Annual Labor Day Challenge down in Melbourne, Florida. I believe each of us, as professional soccer players, loves this game we get to call a job. Despite the uncertainty of our careers, we have our families to support us. When those two loves can come together to create an amazing moment; it makes it — the moving, the uncertainty — all worth it! From those golden days where we were more concerned with halftime snacks than what position we had to play to our professional games, family is always the common denominator. They’ve molded us into the people we are today, they’re the ones who pick us up after loses, retweet our highlights (if they can handle technology better than mine), they’re our backbone and reason we do what we do. I would like to thank all the soccer families out there who make this sport what it is today. Please continue to show your support and we will continue to grow this sport, this league, this club, and this generation of players and the ones to come. Katie Stengel is a forward with the Utah Royals FC. She received a bachelor’s degree in health and exercise science from Wake Forest University. Stengel ended her collegiate career as the most decorated women's soccer player in Wake Forest history, including earning four All-ACC selections and three NSCAA All-American selections. She began her professional career with Bayern Munich, winning the Bundesliga title in her first season. 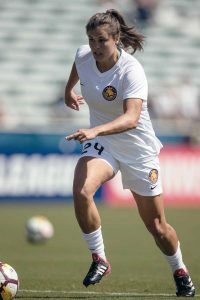 She then moved to the National Women's Soccer League (NWSL) and had stints with the Washington Spirit, Boston Breakers, and most recently, the Utah Royals. Outside of soccer, her interests include everything from reading and puzzling to outdoorsy exploring new places while walking, hiking, or riding in the jeep. Follow Stengel at @ksteng12 on Twitter and Instagram.